With the tax season wrapping up, scammers are out in full force. Perhaps you received a phone call demanding payment from the IRS. They may threaten you with legal action if you do not pay immediately, or say things like, “we are sending the police to arrest you.” While these calls may seem scary, it is important to understand that they are not legitimate. This scam, which started in October 2013, has claimed over $29 million from its victims. Unfortunately, this is just one of many scams designed to make you believe you are speaking with a legitimate government official. Scammers use many tactics in an attempt to force victims to give out information, and sometimes money, via telephone or email. In Social Security related scams, they often call under a guise of helping you complete a disability application, asking you for your Social Security number or banking information. Contact the Federal Trade Commission on FTC.gov. If you are attempting to conduct business with any government agency, or you have received a notice from such an agency, please utilize the telephone numbers provided in the notification. Additionally, you can find contact information on any .gov website such as socialsecurity.gov or irs.gov. This entry was posted in Fraud and tagged benefits, debt, fraud, FTC, government, government official, investigate, IRS, Office of the Inspector General, personal information, Scam, Scam Alert, social security, Social Security benefits, Social Security Number, Social Security taxes, SSA, SSN, tax season, taxes, TIGTA by Doug Walker, Deputy Commissioner, Communications. Bookmark the permalink. Before hanging up, you can ask for the Employee number of the person claiming to be from the IRS. Typically, the id #s start with 1000 or 1001 and are 9 or 10 digits long. Then tell them you know they are NOT an IRS employee (and if someone is dumb enough to give you a SSN, write it down and turn them in). Thank you for bringing this to our attention, David. It is possible that an SSA employee may contact you to follow-up on a previous application for Social Security or Medicare benefits or to follow-up on other business you initiated with SSA. If you are unsure as to the authenticity of someone who claims to be an SSA employee, please call SSA’s toll-free number, 1-800-772-1213, to verify the reason for the contact and the person’s identity prior to providing any information to the caller. Please see “Scams Involving the Impersonation of an SSA Employee” for more information. This is good to make people aware of. I also got a call. long long time ago. I have been never late in my tax returns so I knew right away that this was a false call. I told the guy that go ahead do whatever is best for him but make sure you don’t get trapped doing wrongful. He hung up on me. People who are cheating our government on taxes etc are cheated by these crooks. One hand saves and the other hand gives away. Got a phone call 5/3/2016 on my mobile phone from 920-912-8918 claiming to be IRS. Called back, a man answered “IRS”. There was lots of talking in the background (like a call center). I hung up. Often you will find out the scamming calls come within a Prison! I say what is up with allowing prisoners to have computer access? They gave up their rights when they committed the crime! Stop allowing this to continue . Admin needs to spend more time on the Hackers! I received an email alleging they were from my mail order UAW employees pharmacy that I “owed” a small amount of $ and it was past due. EVERYTHING about the email looked legit, even all the logo normally on the website. But the toll free number was incorrect AND we have auto pay with our credit card! It has been turned over to Medicare Fraud and I learned the $6.70 they said I owed was a way to just get my info from later use with large amounts. I also have my credit card so that any large purchase MUST be verified with the card company and they ask a series of security questions. Beyond the normal criminal offenses such as fraud and theft, impersonation of the IRS (or of the Social Security Administration) is a major federal crime! Got a call from one of these scammers. reported it to the FBI and gave them the phone number. What these scammers don’t realize is that we don’t want to pay the IRS at all. So the joke is on them!!!! We need fair Tax and abolish the true IRS. I did receive a phone call but I don’t get the number I think god for the service amen. I got a call a while ago. They claimed they sent me a letter. I asked for a copy of that letter to be emailed to me. Gave them a secondary email address I have. They mailed a letter showing the last 4 digits of my SSN. I know it was a scam, however it is scary that they had this information. I did notify the IRS (report). When I get such a call I inform them they they have reached a secret government agency and the phone # is only given to field agents. If they call again they’ll suffer termination by extreme prejudice. My wife is a stay at home Retired Business type Woman, very sharp, astute, and a No non sense type; she lets them have it Diplomatically, Friendly Like, and they realize she is ” Bullet Proof ” and they do the only thing they can do is ” Hang Up”. I received a scam call from supposedly IRS that I owe them. The call came from 217-697=6521. I informed the male caller that the call was a scam because I don’t owe IRS anything, he immediately hung up. I also reported this to IRS. Received a call stating that the IRS was going to sue me and to call back on the number left to address this issue. For information in Spanish, please visit us at http://www.segurosocial.gov or http://www.facebook.com/segurosocial. For Social Security information in other languages, please visit us at http://www.socialsecurity.gov/multilanguage. Explain what? Just don’t answer the phone, so are you here legally? Just kidding. This happened to me too. Thankfully I wasn’t intimidated. The FBI and perhaps Homeland Security doing to track down, arrest and prosecute these criminals … you said that over $23 million has already been stolen …. It was very apparent from his accent that the scammer who called me was Indian or Pakistani. I ignored the call but was outraged and imagined that many fell for this scam. What are you doing to stop this beside posting a warning? The government can’t do anything about the scammers. Even Social Security disability can’t stop the scammers from getting disability for anxiety, depression, and back pain. These scammers have doctors and psychiatrist/psychologist backing them up with medical records. They bust one, but there are dozens more still receiving disability and dozen more ready to take their place by the same doctors and psychiatrist/psychologist. Victims got to be stupid to fall for this scam. Wouldn’t it be easier for the scammers to go after the small businesses saying they got video tape of them hiring illegal immigrants and if they don’t pay, then they will call the police. I would not say that the victims are stupid, rather they are uninformed and scared. If the victim is older and the scammer sounds professional enough, they could be intimidated enough to pay money even if they don’t owe it. They may not realize that someone could be evil enough to lie to them, especially if they respect the government and figure they must know what they are doing and yes maybe they do owe some money and they forgot. I have made a copy of this article and plan to have my pastor to discuss this at my church in a meeting. I want to present it at a neighborhood meeting also. I don’t want more people to be scammed if I can help it. If the government can’t do anything about the scammers, the least we, the informed, can do is to help pass on this information to the uninformed. So, LET”S DO IT NOW! Thank you. The government is being scammed themselves with all these disability claims. 5.Whether an individual is “disabled” under the Act. The fraudsters get their doctors to write medical source statements and RFC. The ALJ take the treating source statements and RFC over the Commissioner.The ALJ gives the treating source all the weight in these areas reserved for the Commissioner. As long as the scam still works, people will continue to do them. Most of the disability for mental heath is a scam. Older people don’t seek mental health treatment once they retire. All of the sudden their conditions are no longer severe where they have to see a psychologist /psychiatrist. It is very rare to see a senior citizen in a psychologist/psychiatrist office. It means that most of these people over 50 who suddenly developed these severe mental illness are fraudsters. Once they convert their disability over to retirement, their severe mental illness is gone and they no longer have to see a psychologist /psychiatrist. Every single sentence in your post is fictional; every single sentence came straight from the same incorrect source: your own imagination, personal OPINION, and nasty, negative, hateful attitude. None of what you state is factual, none. You have no training, education, experience, nor knowledge of anything medical, least of all mental illness, that much is glaringly obvious from your ignorant claims. And the funny thing is, your post demonstrates the point of this article – people will believe anything. The unfortnate individuals who believe your ignorant claims is exactly the type person who falls for “official” sounding scams. Someone like you calls and makes all kinds of claims, using an authoritative-sounding attitude like you know it all. We should all thank you for showing all of us exactly how these scams work and why people fall for them. Take note, folks. Tony here just showed us exactly what to watch out for. Just because someone throws around claims and numbers and acts like they’re right doesn’t mean they know what they’re talking about or what they’re saying is true. Once again, if ypu want to know the facts, go to the original SOURCE. Not some self-proclaimed “expert” or anyone who makes claims that they cannot – or will not – back up with crefible, real proof or evidence. Sheesh! I got one of those calls and never answered the phone, so after five tries they just gave up. A law signed in Jan. 1 by the President allows debt collectors to call if you own money on government back loans such as mortgages, school loans etc. Details should be worked out in the next few months. This will add confusion as to is legitimate. Reported ss fraud for years regarding an illegal using some one else’s ss they do nothing? The issued ss was born in 1951 or before the user was born in 1972 how is this allowed..? They turn a blind eye they don’t protect idenifty theft of have the proof want ot? Now a days, it has become very important to be aware of scamming. Sometimes it happens, though we are innocent, we become a victim of scamming. Thanx fo sharing this article. i had also call from a scam company reagrding my account will be suspended if i won”t provide her my debit card details. But i was aware of such things and this article added extra knownledge about precautions. I had a voicemail today on my cell phone from a man claiming to be officer George Peterson with the Headquarters of the Social Security Administration. The automated message said that my SS # had been suspended and that I needed to call: (512) 862-7816. I’m assuming this was a scam. Thank you for contacting us, Shellie. If a person has questions about any communication—email, letter, text or phone call—that claims to be from SSA, please call Social Security’s toll-free customer service number at 1-800-772-1213 (TTY number at 1-800-325-0778) to verify its legitimacy. Representatives are available Monday through Friday, between 7 a.m. to 7 p.m.
What are FATCA and CRS? DNB Bank ASA in Oslo, Norway says that the US signed an agreement with Norway about reporting income. They want my SSN to be sent to them by the end of the month. I had bank accounts with them and a retirement fund started by my former employer, but there have not been contributions to the fund for about 10 years now. I can’t withdraw funds for several years yet, so I have to let it sit. A little counselling would be a wonderful thing. MY SOCIAL SECURITY FORM SSA 1099 IS NOT CORRECT FOR 2017. MEDICARE PART D PREMIUMS ARE NOT LISTED. ALSO, IN TRYING TO SET UP AN ONLINE ACCOUNT THERE WERE MANY CREDIT QUESTIONS THAT DID NOT APPLY TO ME. I AM AFRAID MY ACCOUNT HAS BEEN JEOPARDIZED BY SOME FRAUD. PLEASE HELP! Hello Norma. Unfortunately, but for security reasons, we do not have access to personal records in this blog. Please continue working with your local office. If you are unable to visit the local office, you can call our toll free number at 1-800-772-1213, representatives are available Monday through Friday, between 7 a.m. and 7 p.m. Generally, you will have a shorter wait time if you call later during the day. Thanks. Recently I received a text from FBI. It had a FBI seaI and looked authentic. I knew it was a scam, so didn’t respond. I hadn’t heard of it before and tried to find a place to report it. I was not able to find anything on reporting FBI scams. I did not receive any scam calls until today. I would like to tell thank you to social security administration of U.S.
Lonnie JACKSON, ADA JEAN GREY CARTWRIGHTS, FREEMEN, LAWRENCE FREEMEN, ANNA MINDLER STATES PAYNE, CHEROLETE JACKSON RICHIE, MR MONHU, SYPHONY T TERREL, IDELLA NALLIE WICKS MOORE POLLARD, MR LOWAT, SUE BROWN, DARNELL JOHNSON, (VIVIAN MONHU, MIYA HOSIE, LSVETN HOSIE. OLD FUR COST), MAKERS OBAMA,? BRRACK OBAMA? SCAM! $ , WALLER S. MSNCEIL BROWN BEATRICE BROWN, …..LOTTIE CLAY……, @ .THEFT. I filled out a form by what looked to be reputable from one of my credit cards It said information needed to be refreshed SS number was given. Today there is a $1,000+ purchase I didn’t make. And my credit card information is “out there.” I’m terrifired. I have reported to the consumer.ftc.gov What else needs to be done? I mam reporting a scam. Hi Alex. Thank you for helping us fight fraud. We take allegations of fraud very seriously. If you suspect fraud, waste or abuse of Social Security benefits, we encourage you to report it. A phone # from kileen Texas 254 213 5718 continuios calls threatening legal action about frad with your ss # when told don’t believe your ss they say don’t ever call this # when they in fact keep calling me. Had a person they were from local sherriff office answer and identify themselves selves as such they hung up. They are clearly from a foreign country as they barely speak english. Today I received a call which I didn’t answer, they left a message stating I was to call them right away as they are filing fraud charges if I don’t. I waited for over an hour to talk to ss. I ended up hanging up. The wait time is horrible. We apologize for the long wait, Lee. We may have been experiencing higher than normal call volume. Representatives at our toll-free number, 1-800-772-1213 (TTY 1-800-325-0778), are available between Monday through Friday, between 7 a.m. and 7 p.m.. You will generally have a shorter wait time if you call later during the day or later in the week. If a person receives a suspicious call from someone alleging to be from SSA, citizens may -also- report that information to the OIG at 1-800-269-0271 or online via https://oig.ssa.gov/report. Thanks! We were taken by a fake small business Grant November 2017. By January 2018 the total damage was $47,000 on our credit cards! We lost one account but it could’ve been worse. Or GOOD credit has been a struggle for almost one year now. I know better but didn’t report to the FTC. Depression hit and focus on keeping payments up has been Priority. Our FICO is almost 100 points less! I did not respond or provide any information to the individuals! If you have questions about any communication — email, letter, text or phone call — that claims to be from SSA, please contact your local Social Security office, or call Social Security’s toll-free customer service number at 1-800-772-1213, 7 a.m. to 7 p.m., Monday through Friday, to verify its legitimacy (TTY number at 1-800-325-0778). You may also report the information to the OIG at 1-800-269-0271 or online via https://oig.ssa.gov/report. Thanks! I am receiving telephone messages from a “SSA” office informing me that my Social Security is being suspended and I need to contact a telephone number that is not listed on any of the information I have on Social Security. l-800-772-1213 office which is has various contacts but not one seems to be the proper place . Please can you help– where can I call? write? review? Hi Nancy, thank you for checking in with us. Unfortunately, there are some Social Security impersonation schemes that we are warning citizens about. Was contacted by someone at the above number. Giving away DNA kit. No cost. The people speaking to me were very heavily accented…difficult to understand. I was asked if I had a new card with the new identification on it. I told them I had the new type card. They asked for the ID. I said no and they hung up. The reason that I am writing is because on Thursday 1-31-2019 I received a voice massage that went something like this. The reason that you have received this phone call from our department is to in form you that there legal enforcement actions filed against you and your social security number, being suspected of fraudulent activity. So once you get this message kindly call us back at our number 818-459-6578 thank you. The message sounded like a robo call. Sounds like a scam to me !! I received a phone call today stating that there are issues with social security and I would not be getting any payments unless I reported it. The recording said to push 1 to talk to a person and I hung up. The phone number associated with this call is 1-800-777-2151. If you receive these calls, please report the information to the Office of the Inspector General at 1-800-269-0271 or online. We hope this helps. Hi Shadia: If the caller is claiming to be from Social Security—it is critical that you pay attention to the tone and content of the message from the caller. 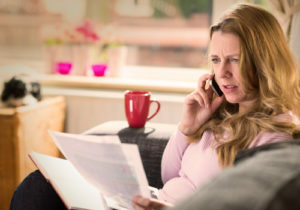 In some cases, the caller states that Social Security does not have all of your personal information, such as your Social Security number (SSN), on file. Other callers claim Social Security needs additional information so the agency can increase your benefit payment, or they threaten that Social Security will terminate your benefits if they do not confirm your information. This appears to be a widespread issue, as reports have come from people across the country. These calls are not from Social Security. A scammer called and repeated my ss# to me . Do I need to report it? Will some one contact me about this? I am having letters from Medicare ……but the person that’s got my name and address it,’s fraud……l was not in usa December 30th. 2018…. please take care of this l live. U.K. …..